Taipei, March 20 (CNA) The de facto U.S. ambassador to Taiwan called on people to "think outside the box" and explore emerging technologies at the opening of the 2019 AIC Innovation Forum Wednesday in Taiwan. Brent Christensen, director of the American Institute in Taiwan's (AIT's) Taipei office, in his opening remarks at the forum, quoted Albert Einstein, who said: "Imagination is more important than knowledge. For knowledge is limited, whereas imagination embraces the entire world, stimulating progress, giving birth to evolution." He said that this year's forum will explore emerging technologies and also how people can learn to "think outside the box" and imagine these technologies. The American Innovation Center (AIC) in Taiwan was jointly established by the AIT and the Taiwan Design Center (TDC) in 2014 to promote U.S.-Taiwan shared values of innovation, digitalization and culture and design by offering technology, creativity and designed-themed programs. During the forum's opening ceremony, Christensen said he was pleased to welcome the Chinese Institute of Design as the newest AIC innovation partner and is excited about the new energy, ideas and resources the organization brings to the AIC. 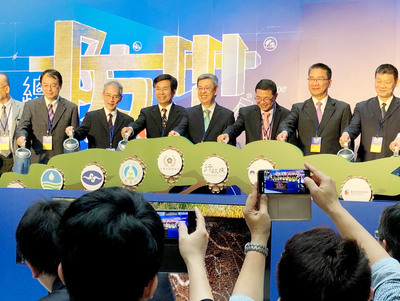 Ministers-without-portfolio Kung Ming-hsin (龔明鑫), who also attended the event, said that the AIC has entered its fifth year and has produced effects on the development of Taiwan's innovation industries and entrepreneurship. The AIC has attained great achievements in enhancing the profile of international enterprises' contributions to Taiwan through the forum, Kung said, adding that the Taiwan Design Center will soon be upgraded to a national design institute. He expressed hope that the institute will collaborate with the United States to yield great results in creativity and innovation. The forum was co-hosted by AIT and the Industrial Development Bureau under the Ministry of Economic Affairs and co-organized by the TDC and the AIC. The "Imagine That! Innovation Exhibition" also opened simultaneously at the Songshan Cultural and Creative Park and will run until April 14 to showcase new trends and ideas in virtual reality and artificial intelligence development by AIC partners, including Microsoft, IBM, Facebook and Yahoo.